The Cunningham Group at Home Savings and Trust Mortgage is proud to announce our Veteran’s Appreciation Package. 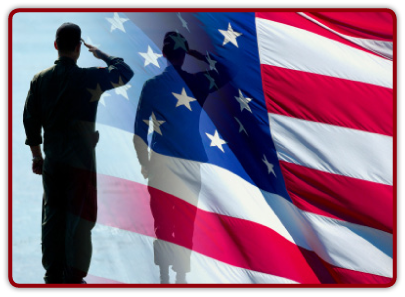 We are industry leading experts in dealing with the Veterans Affairs home loan benefit. We are thrilled to have many clients that have used the benefit to purchase a home of their dreams. We will also be teaming up with local businesses that serve the home purchase market. As a group, we will be offering Veterans discounts on many of the services used when purchasing and caring for your home. Thank you for your service to our country and for allowing my team to be a part of your home purchase or refinance transaction. Residential lender Patrick Cunningham, Vice President at Home Savings & Trust Mortgage, is responsible for lending millions of dollars each year to eligible Veterans. In addition to being a local market leader with the Veterans Affairs Home Loan product, The Patrick Cunningham Team is donating partial proceeds for each VA transaction they do to the Wounded Warrior Project.